The two most popular areas of self improvement is: Designations and Coaching. Below is a partial list of the 70+ professional designations or certifications currently available to real estate professionals. 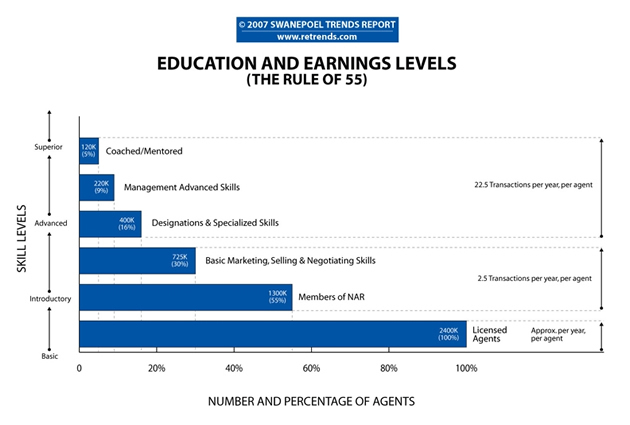 If agents plan to differentiate themselves from the masses of agents, it starts with training and education. REBAC is the world’s largest organization of real estate professionals focusing on BUYER representation. By providing specialized training and ongoing skill development, REBAC helps its members—and the homebuyers who work with them—experience more successful real estate transactions. Contact REBAC, 1-800-648-6224 or visit the REBAC Web site. Acquire valuable real estate management skills through educational offerings leading to the CPM® designation. CPM® members have the competitive edge in every area of real estate management from residential to commercial to industrial. The most prestigious credential for real estate managers of larger portfolios, including those who manage multi-family, office, retail, and industrial properties. Develop leadership, management, and analytical skills while sharing knowledge with other top executives, demonstrating your credibility within the industry and learning increased recognition in the marketplace. Become a preforeclosure short sale expert and join a growing group of real estate professionals who specialize in helping homeowners avoid foreclosure and negotiate a short sale purchases. You can close more deals and start earning nice commissions by helping homeowners avoid foreclosure and sell their house for less then what they owe. Not only that, but you can also start helping bargain hungry buyers save thousands of dollars just by learning how to successfully negotiate a short sale purchase. A win - win for everyone! The National Association of REALTORS® created NAR’s Green Designation to provide ongoing education, resources and tools so that real estate practitioners can successfully seek out, understand, and market properties with green features. The course curriculum requires completion of a 12hr Core Course and a 6hr Elective Course in either residential, commercial, or property management. All courses are available in live lecture and online formats. NAR’s Green Designation gives designees the tools to become a community leader and resource in sustainable issues. The Green REsource Council serves real estate professionals by providing comprehensive training and access to cutting-edge resources and tools as well as promoting green excellence, leadership, and consumer awareness within and across multiple real estate disciplines. Practitioners who complete the 3-day program are awarded NAR's Green Designation, the only green training program recognized by the NAR. Contact your State REALTOR® Association for course dates and locations or go to the listing of State REALTOR® Associations available here. NAR maintains a clearinghouse of information for individuals interested in the GRI program. For more information, visit the new GRI site. Certified residential appraisers wishing to increase their visibility should consider pursuing the RAA designation. The RAA designation is awarded to appraisers whose education and experience exceed state appraisal certification requirements. A ground-breaking professional education initiative designed to provide America's real estate professionals with training and tools to expand their business as well as homeownership opportunities for more Americans. AHWD certification relays to the public that those certified have been professionally trained in and are sensitive to a wide range of cultural issues inviting a wider volume of business from a greater variety of cultures. The goal of this certification offered by the National Association of REALTORS® is to prepare real estate professionals to make and receive compensated referrals using the Transnational Referral system developed NAR and the International Consortium of Real Estate Associations (ICREA). Students will learn how to integrate international referrals, resulting in increased income, into their business plans. When you are involved in an international referral, as a referring or receiving agent, the Transnational Referral Certification demonstrates to other real estate professionals that you are well versed in the procedures of the Transnational Referral system, have pledged to follow a code of conduct in business dealings, and expect that compensation, paid in a timely manner, will be an integral part of the transaction. SFR, Certified Short-Sale Professional is a comprehensive training course for real estate agents that teaches a proven step-by step system to be more successful with short sale transactions. Training includes: How to effectively manage the short sale process from start to finish; How to generate more high quality short sale leads from multiple sources; How to prequalify or filter out those leads that won't get approved so you don't waste time on difficult deals; And how to streamline the process so that all of your short sales close as quickly as possible.